Platinum Wheel-2-Wheel Bars encompass all that Platinum Bars have to offer and more. These Bars feature full length luxury that runs along the truck body from Wheel-2-Wheel to meet the needs of today’s versatile and multi-tasking truck owner. 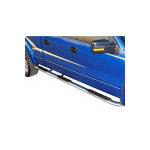 They are designed for trucks with “super”, “extended”, and “crew” cabs to facilitate truck bed access. Their luxurious look and Wheel-2-Wheel length are top of the line in chrome plated or black powdercoated finish on stainless steel. Backed by Westin’s Lifetime Warranty against rust.